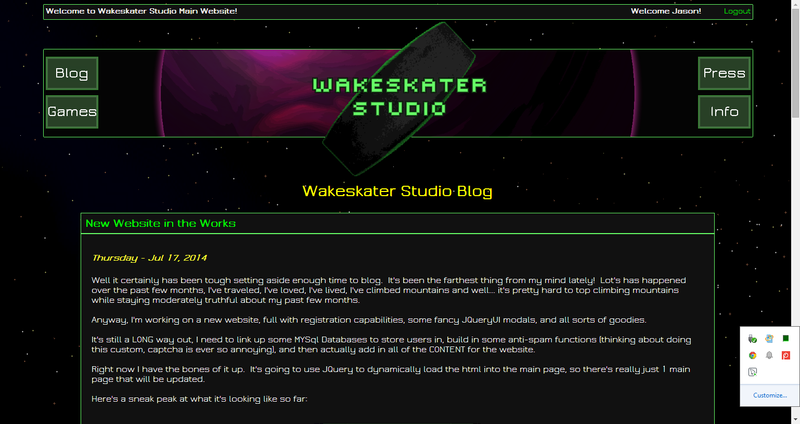 Wakeskater Studio Indie Game Development: Website Updates, RSS Link to this blog, new test game in the works. Website Updates, RSS Link to this blog, new test game in the works. So I've done a little bit of work to the website, namely pulling in the RSS feed from this blog and displaying the four latest posts on my blog page. And I'm always changing up the formatting trying to find a color scheme I like for the page. So any feedback on whether it's too cluttered or not exciting enough etc, helps. Here's a screen shot of the blog page, pulling data directly from this blogger site. The game is going to eventually be a mobile game, and is a take on pattern recognition. It's called Anomaly, and that's all the teaser I'll give for now, but as I get free time I'll try to finish up my website and get that info out. That's it for now, the website is slowly coming along as I have bits of free time here and there to work on it.